sql standards – Java, SQL and jOOQ. Stop Trying to Emulate SQL OFFSET Pagination with Your In-House DB Framework! I’m pretty sure you’ve gotten it wrong in numerous ways, so far. And you probably won’t get it right any time soon. So why waste your precious time on SQL tweaking, when you could be implementing business logic? -- Ingres. Eek, almost the standard. Almost! Do you think you will get it right? Let us go through a couple of issues that you may not have thought about. First off, Oracle. Oracle obviously wanted to create a maximum vendor-lockin, which is only exceeded by Apple’s recent introduction of Swift. This is why ROWNUM solutions perform best, even better than SQL:2003 standard window function based solutions. Don’t believe it? 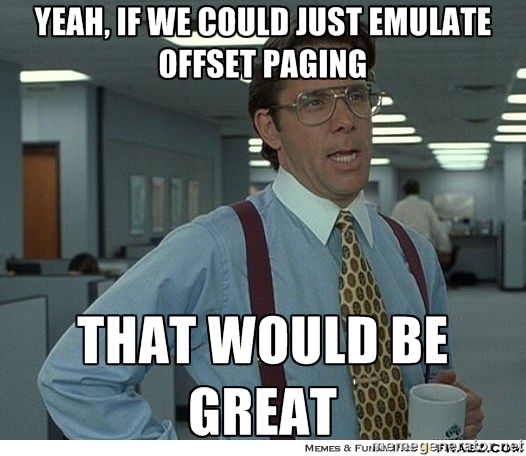 Read this very interesting article on Oracle offset pagination performance. So that’s really the equivalent? Of course not. You’re selecting an additional column, the rn column. You might just not care in most cases, but what if you wanted to make a limited subquery to be used with an IN predicate? SELECT * -- Ouch. These are two columns! So, that’s more like it, right? But since you’re not writing this manually every time, you’re about to start creating your own nifty in-house SQL framework covering the 2-3 use cases that you’ve encountered so far, right? You can do it. So you’ll regex-search-replace column names automagically to produce the above. So now, it is correct? Nope. And the trick of manually patching ID columns from the previous example doesn’t work, because you have multiple ID instances. And renaming the columns to random values is nasty, because the user of your home-grown in-house database framework wants to receive well-defined column names. I.e. ID and… ID. Does the same thing work for SQL Server 2008? But now we got it, right? Make an educated guess: Nope! What happens, if you add an ORDER BY clause to the original query? Now, that doesn’t work in SQL Server. Subqueries are not allowed to have an ORDER BY clause, unless they also have a TOP clause (or an OFFSET .. FETCH clause in SQL Server 2012). OK, we can probably tweak this using TOP 100 PERCENT to make SQL Server happy. Now, that’s correct SQL according to SQL Server, although you do not have a guarantee that the ordering of the derived table will survive after query execution. It may well be that the ordering is changed again by some influence. This is the correct solution! Of course not! 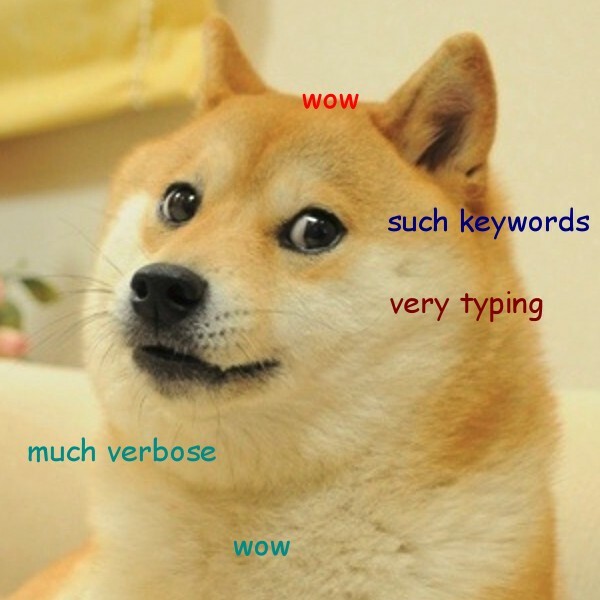 What if the original query had DISTINCT in it? Now, what happens if an author has written several books? Yes, the DISTINCT keyword should remove such duplicates, and effectively, the PostgreSQL query will correctly remove duplicates first, and then apply LIMIT and OFFSET. However, the ROW_NUMBER() predicate always generates distinct row numbers before DISTINCT can remove them again. In other words, DISTINCT has no effect. SQL Trick: row_number() is to SELECT what dense_rank() is to SELECT DISTINCT. Watch out that the ORDER BY clause must contain all columns from the SELECT field list. Obviously, this will limit the acceptable columns in the SELECT DISTINCT field list to columns that are allowed in a window function’s ORDER BY clause (e.g. no other window functions). Do you even know what the column(s) in the window function’s ORDER BY clause should be? Have you just picked any column, at random? What if that column doesn’t have an index on it, will your window function still perform? The answer is easy when your original SELECT statement also has an ORDER BY clause, then you should probably take that one (plus all the columns from the SELECT DISTINCT clause if applicable). But what if you don’t have any ORDER BY clause? Yes, you need to use a variable, because constants are not allowed in those ORDER BY clauses, in SQL Server. Painful, I know. Read more about this @@version trick here. Probably not ;-) But we have probably covered around 99% of the common and edge cases. We can sleep nicely, now. Note that all of these SQL transformations are implemented in jOOQ. jOOQ is the only SQL abstraction framework that takes SQL seriously (with all its warts and caveats), standardising over all of this madness. // Don't worry about the ROW_NUMBER() vs.
With jOOQ, you can just write your Oracle SQL or Transact SQL as if it were as awesome as PostgreSQL! … without jumping the SQL ship entirely, and moving on to JPA. Now, of course, if you have been reading our blog, or our partner blog SQL Performance Explained, you should know by now that OFFSET pagination is often a bad choice in the first place. You should know that keyset pagination almost always outperforms OFFSET pagination. Read about how jOOQ natively supports keyset pagination using the SEEK clause, here. With the ISO/IEC SQL:1999 standard, we could take advantage of grouping sets and (recursive) common table expressions. With the ISO/IEC SQL:2003 standard, we’ve had the very sophisticated window functions and the MERGE statement. With the ISO/IEC SQL:2008 standard, we could perform partitioned JOINs. With the ISO/IEC SQL:2011 standard, we can now interoperate with temporal databases (implemented so far in IBM DB2 and Oracle). And obviously, there’s much more goodness hiding in the almost unreadable 1423-page-long documents. Now, does any of these awesome features appear in JPA? Nope. Will the next SQL standard introduce new awesome features? I’m sure it will! I could imagine that the Oracle / CUBRID CONNECT BY clause, or the Oracle / SQL Server PIVOT / UNPIVOT clauses are good candiadates for standardisation. I’d go absolutely nuts if Oracle’s crazy MODEL clause would make it, too. While exciting things happen at these ends, the ORM impedance mismatch will further deepen and confirm Charles Humble’s recent findings from the QCon, where he’s observed an increasing number of people who are unhappy with popular ORMs’ ever increasing complexity. A complexity example: NamedEntityGraph! Man, did this really have to be added to JPA? Stack Overflow cannot display that many annotations on a single screen! Well, if this is JEE’s answer to SQL’s recent evolutions, then I’m glad I don’t do too much JEE these days. I’m doing SQL, which is an awesome language if let running loose. -- Oracle Omit's the standard's "X"
-- using octal representation of bytes in literals.